The NZ dollar may have changed as payment was en route to this Australian organisation. 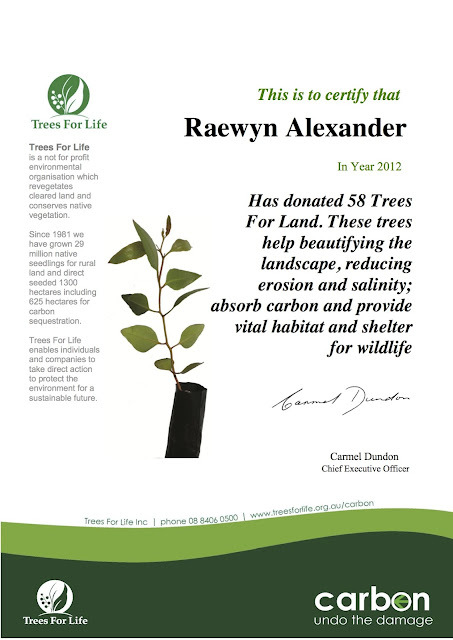 Originally I purchased 70 trees. Have also grown and given away nine other trees, and planted two I bought in a friend's and my garden. Six other seedlings are growing to give as time goes on. Seventy trees absorb carbon produced from one return flight to Europe (for one person), which I believe equals my one-way flight home from the States, plus my cruise and the trains and two short domestic flights I took in the USA. I'm also now vegetarian which covers carbon from car travel there and my car here. I've paid for trees for my travel, so the carbon produced by planes, trains, boats and cars I travelled in can go into trees and not destroy where we live. It only cost me just over $NZ200- My vegetarianism also assists with producing less greenhouse gases. The travel itself was a joy. People have been swapping stories with me about their encounters, inevitably. Someone told me they had an affair in New York and while they were wildly enjoying themselves one evening, as lovers do, her male friend started chanting in another language like Celtic or Latin as if casting a spell, a magical incantation to perhaps protect himself, or enchant her, or...? She wasn't sure. She, like me, also found that every day or so after her return home something reminded her of where she'd just been, like the universe was trying to make sure she didn't forget the States, or more importantly her friends there. Myself, I keep seeing or hearing things which point me back to where I've recently and sadly departed. (I sobbed when the plane took off from LAX finally across the Pacific Ocean, surprised myself, such a wrench to leave). I realise those 'signs' are co-incidences, some of them slight. My friend and I agree, we do not seriously entertain the idea we're getting some kind of message from the universe in fact, but it's obvious our everyday lives will never be the same. We count and treasure these random references to another land, to various wonderful people there and the sights, sounds, smells and tastes of the Yoo Es Aye, because we've altered. We fit into the world differently now and possibly forever. When we recognise references to someone or somewhere in our everyday life, tiny clues in the chaos appear to form a pattern which we make familiar. Associations evoke emotional responses, we feel more comfortable to admit them within, to include ideas and feelings around certain newly acquainted people and places in our ordinary experiences, our day-to-day scenarios have expanded or shifted and bonds of friendship are even stronger than they were before. I'm vitally interested in love of people and loving where we live, actively making the world a better place wherever possible. 'Sure, go ahead.' I smiled. She went through the words, a dynamic rap. I asked who wrote it. 'Tupac Shakur,' she said and rather looked like I wouldn't know who he was, at all. 'Thought it could be,' I said, 'I've heard a lot of his work.' Agreed too that I did think it was poetry, since she asked if I thought so, and I explained many of the young people I worked with for years in education did send me a great deal of Tupac, to listen to. I admire him. All those musings may seem foolish to others, I simply have to make some kind of sense of this and ensure I'm still connected in some way, so I can live with things as they are rather than wish for impossibilities. So, surely, then there was New York. Has any city ever evoked craziness, excitement and wonder in the same way that NYC does as soon as its name is mentioned? Do those three words I used even get close to the insane beauty and fascination of the place? And can the series of short movies I shot inexpertly, in a state of culture shock at the time help me relive the experience of visiting New York City, or will I always long to go back there to check if in fact it is as fascinating as it appeared to be, every moment, even when I was asleep? I slept in a state of amazement while I was there. My friend Dean texted me when I pulled into New York train station, 'New York is a monster.' He was right. Glad someone warned me before I realised I'd been swallowed alive. His many texts across the U S A helped me stay on some kind of even keel, as much as I ever do and I've thanked him before but I must do so again, his messages were deeply appreciated. Today, I received on a disk from the photo-shop a few precious minutes of footage from New York, (as I mentioned) taken during my week there at the end of my trip of a month across the top of North America. The many still photographs I took were stolen with my laptop. I hold some memories as well, naturally, but they're inevitably a random series of highlights and change with each re-run. Human beings reform our recall to suit wherever we are at the time, but this writing could help me to keep those glimpses of the past in mind alive with more alacrity and real definition, perhaps. New York was on my list of places I had to see, since I was much younger. One other place was the Swiss Alps just by the way which I did drive through on a Magic Bus, en route to Greece once upon my 20s with a boyfriend who planned the trip for ages. (We travelled Europe, Britain and Eire for about 18 months). After recent disasters however I decided the New York I wanted to see wouldn't be there, but someone or a few people really, convinced me to go anyway and so, I did. Nothing could've prepared me for the cacophony outside New York Train Station on arrival. Thank goodness I had a Red Cap to assist or I could still be standing there lost and bewildered in the teeming, diverse and strenuous crowd. I recall so much but the movies I just received back on a disk, do not do the experiences I had in New York justice at all. The link is at the end of this blog, nevertheless. I'm homesick for America, ooo that could be a country song I suppose. while the rain here gets me down. so this heartache I can bear. Nothing I can do to change anyone but myself. I did sit in the sun today for such a long time, some of the sun's brilliance and warmth affected me, I feel livelier. Exercise also a fine way to beat the blues and I strode round the Auckland Wintergardens, loving those jungle plants, their apparently painted leaves, banks of orchids purple, white and lime green like a child's fauvist picture. Since all the walking and weight loss on holiday, (along with avoiding tomatoes, potatoes, eggplant and capsicum) I can stride again, my knee seems almost entirely free of arthritis and I love the sensation of freedom. I won't be travelling anywhere much again. About my astounding poetic trip to america I feel delighted and also, deeply sad. "...nothing here but my own tragic hands that once were guarded by a world of sweet attention that now are left to guide and disappear into the common dark of all our debt...and all that road going and all the people dreaming and the immensity of it..."